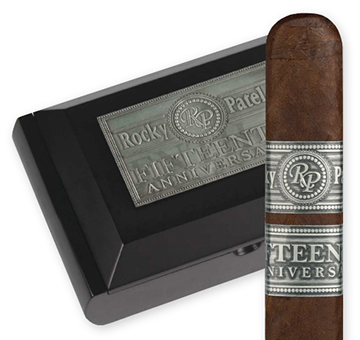 Rocky Patel introduced the 15th Anniversary box-pressed cigar in 2010 to celebrate the Patel brand's fifteenth successful year as a boutique cigar manufacturer. Hand rolled in the Cuban style at Rocky's own Tabacalera Villa Cubana S.A. factory in Esteli, Nicaragua, the 15th Anniversary's blend of Nicaraguan filler and binder tobaccos is finished with an aged high-priming Ecuador Havana wrapper, which imparts an elegant and flavorful full-bodied profile with notes of dried fruit, creamy cocoa, cedar, and spice with coffee and earth at its core. The Fifteenth Anniversary cigar is superbly constructed with a flawless draw and makes the perfect commemorative cigar to mark this auspicious milestone.